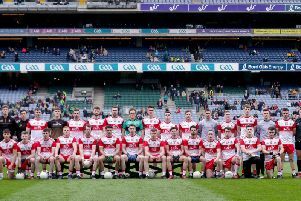 Damian Barton has challenged his players to replicate their second half performance against Meath and take Derry to a first All Ireland Quarter-finals since 2007. The Oak Leafers recovered from a poor first half showing against the Royals to secure an impressive 1-14 to 1-11 victory with Niall Loughlin’s 68th minute goal the pivotal score of the game as it put Derry into the lead for the first time in the match. It was a lead they wouldn’t relinquish with a disappointed Meath manager Mick O’Dowd stepping down from his role after the match. There is no point going out and winning today if we don’t turn it around in six days and get another result next week as well. There was more good news for Derry fans as Enda Lynn made a scoring return to county colours on his first appearance in a Derry shirt since breaking his ankle in the McKenna Cup match back in January. Barton said he was delighted to have Lynn back among his attacking options but stressed the importance of every player to a performance which put Derry into the last 16. Despite seeing his side go into half-time trailing by 1-08 to 0-4, Barton said he didn’t have much to say during the interval as the players knew they needed to improve. “If you play this game long enough and then you are a manager as well, we have all been in this situation. We didn’t go out and express ourselves in the first half at all. We looked lethargic; we looked slow, tired actually. We weren’t tuned into the game at all. “We had talked about the start being so important, especially when you are playing at home, but I suppose we put our start off our 35 minutes. We got through in the end and if I was in Meath’s position I would be very disappointed. Really the scores we got at the start of the second half were the telling scores. It put them on the back foot mentally. “I am very proud of the players and it was nice to see Enda Lynn back out playing again but there is no point going out and winning today if we don’t turn it around in six days and get another result next week as well. “We are in Round Three and I am not being disrespectful but I said to the boys I believe there are teams on a par, or even slightly lesser than us, who are already in Round Four. That’s not their fault. We haven’t got to the last eight yet but if we get that far we will know we have achieved something.